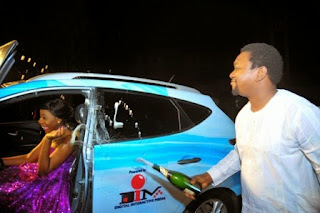 Akinwale Oluwafeyisekemi Ayomiposi has been presented with the grand Prize of a Hyundai IX 35 SUV for emerging the overall winner of the Next Movie Star Africa Reloaded 2013 at a winners party held recently. The event which took place at the Troy Lounge ,Lagos ,southwest Nigeria had in attendance dignitaries from all works of life including the Commissioner for Information Ondo State, Mr. Kayode Akimade who represented the Governor ofOndo state, His Excellency Governor Olusegun Mimiko, Comedian and Masterof ceremony Gbenga Adeyinka the 1STCFR, the regent of Idoani Ondo State,Her Royal Highness Atewogboye Adetutu,C E O Digital Interactive Media Mr. Sola Fajobi,tv and radio presenter Soji Omotayo and former Winners of the Next Movie Star Tamara Eteimo and Halimat Aitsegame. Making the presentation Mr. Kayode Akinmade eulogized Feyisekemi for her exploits during her stay in the Next Movie Star House which lasted for 30 days. He commended her intelligence, high sense of moral values,acting skills and an high level of discipline . Akinmade commended her for being a true ambassadorof the people of Ondo State and Nigeria as whole and prayed for her to succeed in her chosen career as an actress. 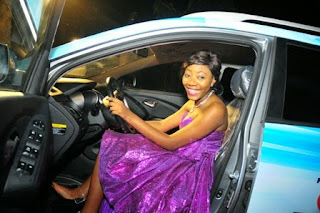 Akinwale Oluwafeyisekemi Ayomiposi,age19 is presently studing French in Ekiti State University,she beat 18 other contestants from 10 African countries to emerge the winner of the prestigious "Next Movie Star" Reality TV Show. The Next Movie Star Reality TV Show has discovered successful Stars in The Africa Entertainment Industry than any other reality show platform since it berth in 2005. Those who have passed through NMS include Tonto Dike, Annie McCauley, Kevin Chuwang Pam, PorttiaYamahan, Uti Nwachukwu, Lydia Forson, Karen Igho, Tamara Eteimo, Tomiwa Kukoyi, Halimat Aitsegame, Boma Mac Ake, Zerziyia Wilson and others. The Next Movie Star Reality TV show organized by Digital Interactive Media Ltd is the only independently produced reality show in Africa which has been consistently running for the 10th edition.